Russell Crowe says the Gallipoli film he is shooting in South Australia’s Mid North has proved challenging to direct but he is revelling in the great people and locations within our state. The Oscar-winning actor told The Advertiser today he was enjoying his time in the Mid-North, where he has spent the past week directing The Water Diviner. “I love South Australia. I’ve been coming here for quite a few years now,” he said. Crowe said it was the moving narrative that attracted him to the film, in which he plays a father who loses his three sons in the World War One battle of Gallipoli. “The Water Diviner is about the aftermath of war, it follows the story of a guy called Joshua Connor who has three robust, loving sons and as was expected of them at the time, they all join up (to fight),” Crowe said. “Three of them are shot on the same day in Gallipoli. It sets off a series of other negative events in his life, he ends up going to Turkey to try and retrieve his three sons. 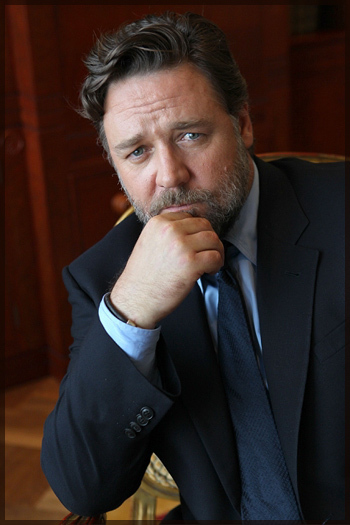 Crowe said he was managing to juggle his acting and directing duties well. “I’ve had lots of roles come my way in terms of people wanting me to direct, probably for 10 or 15 years but not as challenging as this one,” he said. Crowe said he planned to be in SA for five weeks. “Then we’re shooting in Turkey, in Istanbul, then down to the southern coast of Turkey,” he said. Crowe, dressed in a black suit and hat in hot conditions, filmed one continuous take, where he solemnly rode up and down a dusty track at Peet Hill, near Eudunda, about 100km from Adelaide, which lasted more than 20 minutes. Several crew members, watching the action unfold on nearby monitors, commented on the length of the shot and said it was among the longest they had worked on. The shoot took place in front of a picturesque church, which was used for later action. Fellow Australian actor Damian de Montemas was also on set, dressed in Outback attire – beige pants, brown boots, a white shirt and an akubra hat. Crowe has been a familiar sight in the nearby Mid-North town of Burra. Several locals told The Advertiser they had spotted Crowe on a bicycle cycling from Burra to the sets of the Gallipoli film at World’s End, about 25km away . He even did so during last week’s heatwave, where the temperature regularly topped 40C. Cook O Burra cafe owner Jenetta Sosa said she had served Crowe and crew members coffee on several occasions. “My son told me who he (Crowe) was and I just couldn’t believe it,” Ms Sosa said. It is believed Crowe is staying in a private residence. Scenes were also shot at Unicorn Brewery Cellars in the heart of Burra. On Saturday Crowe filmed another scene on horseback before dining at Italian restaurant La Pecora Nera. Other SA filming locations for Crowe’s directorial debut, in which he plays a father searching for his missing sons in the wake of the Gallipoli campaign, are believed to include Port Augusta, Quorn and Adelaide before cast and crew move on to Turkey. Some crew are already staying in Port Augusta and more are expected to arrive in the Spencer Gulf city later this week. Burra is no stranger to film sets – parts of the horror flick Wolf Creek 2 were also filmed there. This entry was posted on Friday, January 24th, 2014 at 11:50 and is filed under Movies, News, The Water Diviner. You can follow any responses to this entry through the RSS 2.0 feed. You can leave a response, or trackback from your own site.